Levitation®2 prevents injury and reduces fatigue, so you’ll be able to give your all — even in double overtime. Hockey’s fast-paced play and wide range of movement places the knee under prolonged periods of stress on the ice. And whether you’re a skater or goaltender, collisions are inevitable. You wear gloves and a helmet, but do you single out your knees for protection? Levitation is designed to reduce effects of high-impact activity and increase muscle output by absorbing your own energy and releasing it when you need it most. The result: your power on the ice is increased and your time on the bench reduced. You’ll be in the game longer, and stronger than you were before. Our revolutionary knee braces do more than just stabilize your knee. 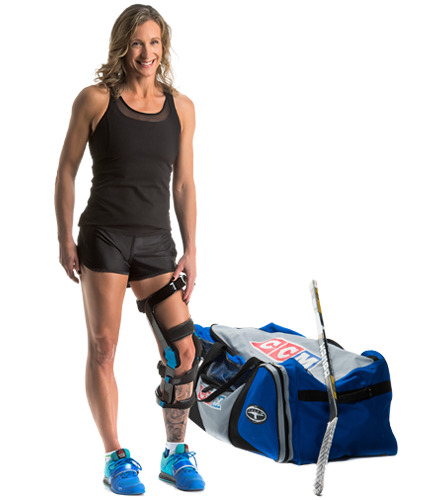 The Levitation bionic hinge enhances your leg muscle power by storing energy as you bend your knee and returning that energy as you straighten your leg. The result is the world’s only compact and powerful bionic knee brace capable of boosting your strength and performance. Our proprietary hinge mechanism relies on state of the art engineering and was inspired by the landing gear of fighter jets.